Keith Heitzman was one of three fifth-year seniors to leave the Michigan program in January after Jim Harbaugh was hired as head coach. He announced earlier this month that he’ll land at Ohio University as a graduate transfer, but hadn’t divulged some of the circumstances around his decision to leave the program. In an interview with the Columbus Dispatch this week, Heitzman said every fifth-year player would have to audition for a spot on the team during spring practice. 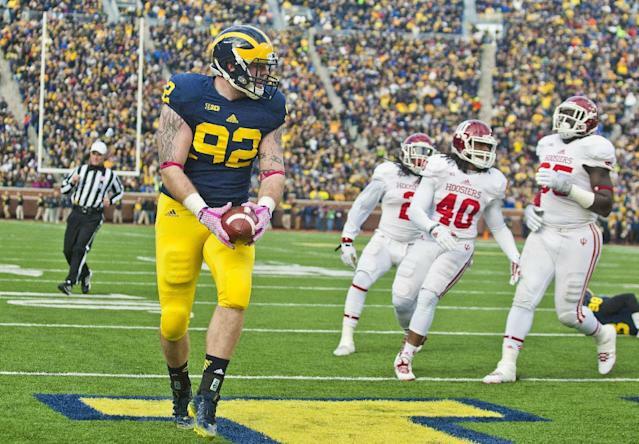 Heitzman played in 36 games, including eight starts, at both tight end and defensive line for the Wolverines under Brady Hoke, earning three varsity letters. He told the Dispatch it was difficult for him to leave UM, but he ultimately made the decision the same week quarterback Russell Bellomy (who landed at UTSA) and Southern Miss-bound running back Justice Hayes (both fifth-year seniors) did. At Ohio, he’ll get the chance to play one final season of college football in his home state while pursuing a master’s degree in recreational sports sciences. Heitzman is now the second Michigan transfer to speak publicly about leaving the program this offseason. Defensive lineman Ondre Pipkins, who was entering his fourth year, said earlier this month that Harbaugh and medical personnel pressured him into signing a medical scholarship. Pipkins, who announced his transfer to Texas Tech last week, is coming off a knee injury but says he can still play. Pipkins told ESPN that he thought Harbaugh wanted to “free up” his scholarship. Harbaugh said he was looking out for Pipkins’ health.